Acute liver failure 는 사망률이 높은 질환입니다. 이때 보조적으로 사용할 수 있는 방법이 high-volume plasma exchange (HVP) 입니다. 이번에 소개드릴 논문은 Journal of Hepatology에 실린 RCT 결과입니다 (Larsen FS. J Hepatol 2016). BACKGROUND & AIMS: Acute liver failure (ALF) often results in cardiovascular instability, renal failure, brain oedema and death either due to irreversible shock, cerebral herniation or development of multiple organ failure. High-volume plasma exchange (HVP), defined as exchange of 8-12 or 15% of ideal body weight with fresh frozen plasma in case series improves systemic, cerebral and splanchnic parameters. METHODS: In this prospective, randomised, controlled, multicentre trial we randomly assigned 182 patients with ALF to receive either standard medical therapy (SMT; 90 patients) or SMT plus HVP for three days (92 patients). The baseline characteristics of the groups were similar. The primary endpoint was liver transplantation-free survival during hospital stay. Secondary-endpoints included survival after liver transplantation with or without HVP with intention-to-treat analysis. A proof-of-principle study evaluating the effect of HVP on the immune cell function was also undertaken. RESULTS: For the entire patient population, overall hospital survival was 58.7% for patients treated with HVP vs. 47.8% for the control group (hazard ratio (HR), with stratification for liver transplantation: 0.56; 95% confidence interval (CI), 0.36-0.86; p=0.0083). HVP prior to transplantation did not improve survival compared with patients who received SMT alone (CI 0.37 to 3.98; p=0.75). The incidence of severe adverse events was similar in the two groups. Systemic inflammatory response syndrome (SIRS) and sequential organ failure assessment (SOFA) scores fell in the treated group compared to control group, over the study period (p<0.001). CONCLUSIONS: Treatment with HVP improves outcome in patients with ALF by increasing liver transplant-free survival. This is attributable to attenuation of innate immune activation and amelioration of multi-organ dysfunction. 급성 간부전 환자 182명을 standard medical therapy (90명)과 standard medical therapy plus high volume plasma exchange (HVP) (92명)으로 무작위 대조군 비교 연구를 시행한 결과입니다. HVP 를 시행받은 사람들은 그렇지 않은 사람들에 비해 생존율이 유의하게 높았습니다. 물론 이식(LTx)을 받은 분들이 성적이 가장 좋았습니다만..
급성 간부전은 비교적 드문 질환입니다. 이 연구에 환자를 등록하는데 12년이 걸렸습니다 (1998-2010년). 연구자들의 열정에 존경심이 들었습니다. 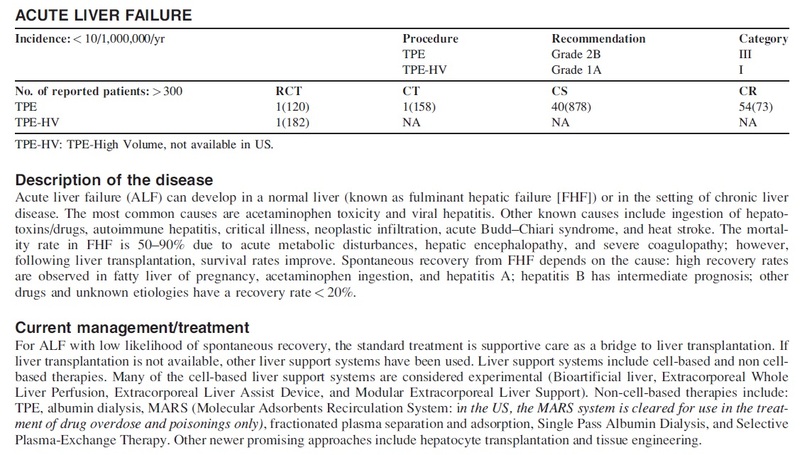 이 자료 등을 근거로 2016년 American Society for Apheresis에서는 acute liver failure데 HVP를 category I, grade 1A로 권고하고 있습니다 (Schwartz J. J Clin Apher 2016). HVP는 국내에서는 급여 인정되지 않는 치료입니다. 비급여 또는 100/100으로도 할 수 없다고 합니다. SMC에서는 HVP가 기술적으로는 가능한데, 우리나라 급여정책 문제로 HVP를 시행하지 못하고 있었습니다. 한번 HVP을 할 때마다 모두 삭감이기 때문에 병원에 350만원 이상의 손해가 발생한다고 합니다. 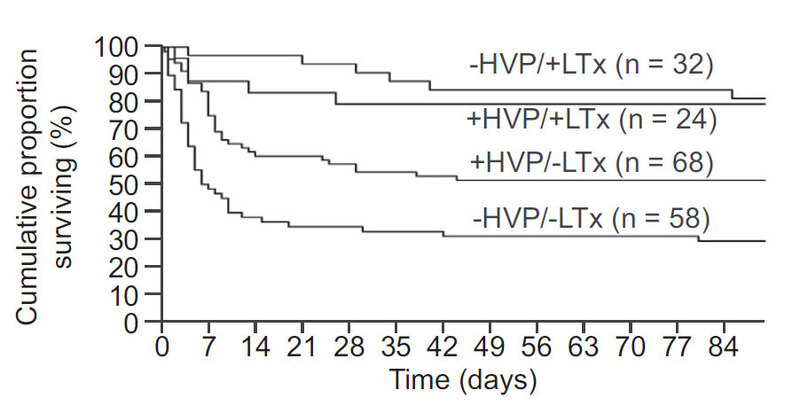 그래서 아이러니하게 제 첫 HVP 환자는 acute liver failure (r/o drug-induced) 로 coma상태로 전원온 외국인 환자였습니다. 간이식을 진행하려고 내원하였는데, donor가 fatty liver가 심해서 이식 진행이 어려웠습니다. 다른 생체 간 기증자가 검사가 진행되는 동안 외국인은 급여와 무관하므로 두 차례 HVP를 시행하였고, HVP 시행 후 의식이 호전되어 이식이 취소되고 환자분은 spontaneous recover되어 퇴원, 본국으로 귀국하였습니다. 첫 환자의 경과가 좋아서 이후부터는 급여 정책과 상관 없이 삭감되면 이의 신청을 하겠다고 마음먹고 한국인 환자에서도 HVP를 시행하고 있습니다. 삭감통보가 오면 강력히 의의신청을 해 보려고^^ 준비 중인데 아직 서류를 받지는 못했습니다. 이후 한국인 두 분에게서 HVP가 진행되었고, 두 분 모두 간이식을 받고 회복하였습니다.